I'm sure you all have heard that old saying, "when the cat's away, the mice will play", well for this mouse the cat just headed off for a hunting trip. This mouse has big plans, make that super big plans, they involve non-stop yoga pant wearing, zero make-up or hair combing, eating raw cookie dough (I like to live on the wild side and add raw egg) (GASP), lots of take-out, staying up late doing crafts, some sort of Netflix bender, and possibly a pan of these Peanut Butter Cup Brownies. If that sounds like your kind of weekend you should call me, I mean I do love me a good brownie, but even on my best day, I'd have trouble consuming more than half a pan. Brownies are the kind of thing you need to share. 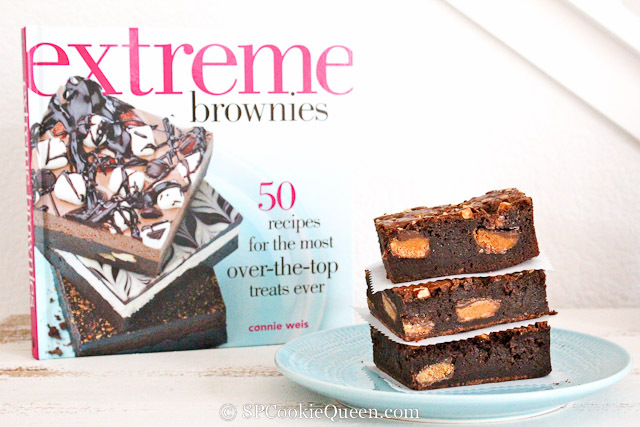 I was asked if I would like to review "Extreme Brownies" and I reluctantly said yes. Not because I don't love brownies, it's just I've had some real disappointing ones over the years and I'm not even going to lie here, my kids will say after many of them, "Can't you just make the ones in the box." I made Connie's Today Show Peanut Butter Cup Brownies first and gave quite a few away and everyone seemed to really like them. I had a few left sitting on the counter and I threw all my will power at avoiding them, yet every time I turned around I was leaving the area with a small piece in hand. It didn't help that they were so darn thick, fudgy, and rich. I see why Connie has done so well with these brownies, they are a bit addicting. When I’m in the kitchen, I like to listen to either the TV or radio (preferably NPR) for background fodder as I’m cooking. One day on the Today show, Hoda Kotb held up a package of brownies she’d bought at a grocery store as one of her favorite things that she likes to share with viewers. I made a mental note that my brownies looked a lot better, and one day I would send her some. About six months later I did, and I hoped I would get a reply from Hoda, maybe with an autographed picture. Instead, I had an email from the producer asking me if I would like to come on the show to do a cooking segment. I was thrilled, and in July 2012, some friends and I went to New York and had a blast with my 15 minutes of fame. One of the results of that appearance, however, is that I always have people at my booth asking for the Today show brownie, so as much as I like to change up my selection, this is one I always have to bring. 1. To make the brownies, adjust an oven rack to the middle level of the oven and preheat to 350°F. Prepare a 9 by 13-inch baking pan with heavy-duty aluminum foil as shown on page xvi. Lightly grease the foil in the pan. 2. Unwrap the peanut butter cups; set aside. 3. Cut the butter sticks into 1-inch slices. In a small, heavy saucepan, melt the butter pieces over the lowest setting. While the butter is melting, chop the unsweetened chocolate into ¼-inch pieces and add to the melted butter along with the bittersweet chocolate chips. Use a small whisk to speed the melting process. When the chocolate is melted and completely smooth, turn off the heat but leave the saucepan on the burner while proceeding with the recipe. 4. Using a large whisk, lightly beat the eggs in a large mixing bowl. Place the sugars and salt in a separate small mixing bowl, then whisk into the eggs just until incorporated. Briefly whisk the melted chocolate mixture, then gradually whisk into the egg mixture until just combined. Briefly whisk in the vanilla. 5. Place the flour and baking powder in the small mixing bowl; whisk together to combine. Sift through a medium strainer directly onto the batter; stir in with a silicone spatula until just combined. Pour the batter into the prepared pan and spread evenly with a small offset spatula. Push the peanut butter cups into the batter; do not place any within ½ inch of the pan sides. Use the offset spatula to cover the candy with the batter. Sprinkle the chopped peanuts over the batter, then place the milk chocolate chips evenly on the batter. Bake for 35 minutes, until a toothpick inserted in the center comes out clean. Transfer the pan to a cooling rack and let cool at room temperature for at least 15 minutes, then refrigerate the pan for 7 to 8 hours, or overnight. See page xix for instructions on removing and cutting the slab, and for refrigerated storage (up to 3 weeks) and freezing guidelines. From Extreme Brownies: 50 Recipes for the Most Over-the-Top Treats Ever by Connie Weis/Andrews McMeel Publishing, 2014. Come on friends don't let me down, come on over and help me polish some of these off. Besides if none of you come and help me shave some calories off my bottom line, I'm going to have to go to the gym and work some of these off and there is no way, I repeat no way I want to do that this weekend. These brownies definitely live up to their name. Extreme Over the Top Peanut Butter Cup Brownies These would be so dangerous in my house. I would definitely hide them from Scott. He has no .willpower, and I don't have much. Have a great weekend. I'll talk to next week, and tell you about my week. These look dangerously delicious, love that layer of peanut butter cups! Oh my heavens! These brownies look beautiful! 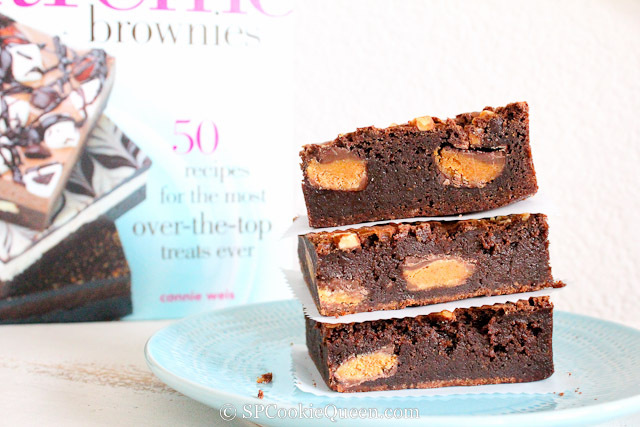 I fell in love with a peanut butter brownie at a local coffee shop years ago...unfortunately it closed...I'll have to create these in honor of the shop! Jaime, Ha, love it, we could do nothing together anytime, sounds perfect. Chocolate and peanut butter...can't beat the combination. These look heavenly! Have a great weekend, Gina! Wow, these look extremely good. ;-) Really terrific brownie recipe -- thanks. I have been eating so many brownies recently. It's the one thing that keeps me going, I am addicted. I didn't realise how easy they were to make. Now I am going to have to try your recipe too.